Fifty years ago, on April 4, 1968, the Rev. Dr. Martin Luther King, Jr., was assassinated on a balcony of the Lorraine Motel in Memphis, Tennessee at the young age of 39 years. Dr. King was a non-violent, civil rights activist who championed the cause of racial equality and faith in God to overcome any obstacles. Fr. Christian Reuter recently shared his story about meeting and photographing Dr. King in the summer and fall of 1967. The first time was on a hot Saturday afternoon in Cleveland, Ohio, where I was in a summer program to learn pastoral ministry skills right after completing my studies in the Franciscan seminary. My supervisors thought that I was out visiting orphanages and nursing facilities, but I now confess that I was actually on street corners registering voters. I also volunteered my time with an ecumenical pastors’ association that was organizing a boycott of a major grocery chain that practiced racial discrimination. When Dr. King came to town for a series of outdoor speeches, I drove the flatbed truck on which his podium was mounted. The second encounter was at a churchyard on the south side of Chicago, where I was beginning my career as a high school English teacher. It was at a rally, as I recall, preparing marchers for a demonstration to protest discriminatory “red-lining” real estate practices. 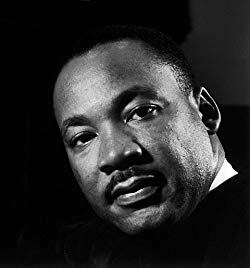 When he was assassinated in 1968 not even a year later, it was a painful pastoral duty as a teacher at Hales Franciscan School to accompany my students during the unrest and riots that engulfed Chicago and so many other place in America. As we commemorate his death fifty years ago, I treasure the photographs of Dr. King as personal “icons” of a prophet whom I was privileged to briefly meet.